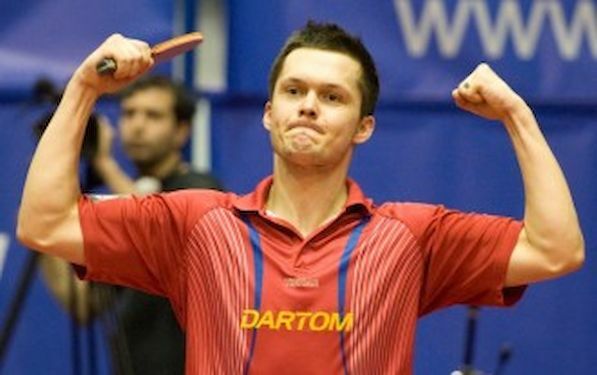 Dartom Bogoria Grodzisk repeated the success from the opening leg of the men’s ETTU Cup semi final and overcame French Istres Tennis de Table. In the first match Polish side succeded after full distance duel, and now in front of home crowd they needed one match less. Like two weeks before Daniel GORAK brought first point in the match to his team and he did it in same style – after five games. And he repeated another success – he beat Christophe LEGOUT once again. GORAK recovered from 2:0 in reverse to clinch the victory. JIANG Tianyi had much easier task against CHEN Jian. He brought next point to Polish side afther the straight games victory. Antoine HACHARD was two games down and Robert FLORAS was close to seal the match, when French player recovered to win. He brought Istres back to life, but it did not last for long. From the first moment GORAK was in winning mode. CHEN Jian had his chances in third game and he seized the opportunity. Then, CHEN forced the match to the decisive game, but in the finish GORAK prevailed.